Rob Fidler was born in Cheltenham on 21/09/1974 and is the son of Gloucester legend John Fidler who played in the second row for the Cherry and Whites in the 1970’s and 1980’s, making 281 appearances for the club and winning four England caps, before going on to become the Gloucester team manager during a large part of Rob’s career at the club. Having been a fixture in a very successful Gloucester United side, Fidler junior made his debut for the Gloucester First XV in a friendly against Moseley on 31/12/1994 at blindside flanker, with his first involvement in a Courage Championship game coming a week later as a substitute against Wasps at Kingsholm. He continued at blindside flanker at the start of the 1995/1996 season before playing Number 8 against Wasps at Kingsholm on 14/10/1995. He played his first game in his favoured position of lock forward away against Nottingham on 27/01/1996 in the Pilkington Cup 5th round, alongside Dave Sims, the first team captain. Fidler started the majority of the remaining games of the 1995/1996 season in the second row, including the Pilkington Cup semi final defeat to Bath at The Rec on 23/03/1996; in doing so he kept England international Richard West out of the starting XV. Fidler and Sims would go on to form a formidable second row partnership for the Cherry and Whites as rugby made the transition from the amateur to the professional era. Having established himself as a fixture in the first team he went on to play in many big games for the club including the narrow Pilkington Cup semi-final defeat to Leicester at Kingsholm during the 1996/1997 season. 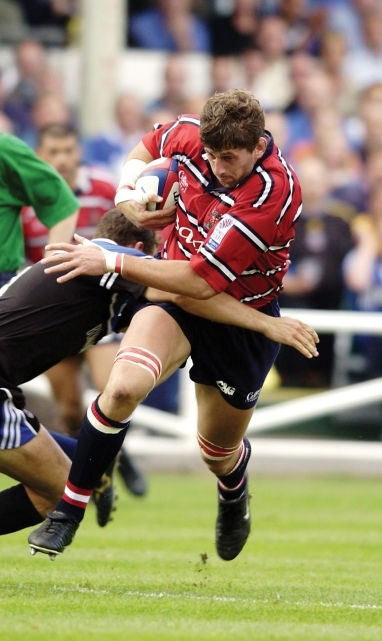 However, Fidler missed both of Gloucester’s Cheltenham and Gloucester Cup final victories over Bedford at Franklin Gardens during the 1997/1998 and 1998/1999 seasons, after being selected to play for England A on both occasions. In 1999 he experienced more cup heartache playing in the Tetley’s Bitter Cup semi-final defeat to Wasps, before finally claiming what was now the Powergen Cup in 2003 when he started in Gloucester’s 40-22 victory over Northampton at Twickenham, during which he was sin binned after 21 minutes for talking back to the referee. He helped guide Gloucester to third in the 2001/2002 Zurich Premiership table before playing in the playoff final victory against Bristol Shoguns at Twickenham, which Gloucester won 28-23 earning them a wildcard European qualification. The playoffs were contested by the teams finishing 2nd – 8th in the table that season, after Leicester finished top as champions. During the 2002/2003 season Fidler was a key figure in the Gloucester squad that finished 15 points clear at the top of the Zurich Premiership table, coming off the bench at half time for Mark Cornwell in the playoff final defeat to Wasps at Twickenham, who became the first team to be crowned English champions through the playoffs. During his time at Gloucester he was also selected to play for the South West divisional side. Fidler left Gloucester to join local rivals Bath at the end of the 2002/2003 season after 9 years at the club and over 250 games. Having failed to agree a new contract his agent John Partridge managed to secure an offer from Bath, coached by the vastly experienced Jack Rowell at the time, who recognised the value of Fidler’s experience at the highest level. He became a key member of the Bath squad and signed a new two and a half year contract with the club in February 2006 but was released in December 2007 having made only one substitute appearance that season, after struggling with knee problems, which led him to go under the knife for reconstructive knee surgery in October 2007. At 33 Fidler was due to be out of contract at the end of the 2007/2008 campaign, however Bath decided to pay up the remainder of his contract. During his time at Bath Fidler made 56 Premiership appearances for the club and over 80 in all competitions, helping them to finish top of the 2003/2004 Zurich Premiership table and coming off the bench for Danny Grewcock in the playoff final defeat to Wasp at Twickenham. He started the 2005 Powergen Cup final against Leeds Tykes at Twickenham, which Bath lost 20-12, but missed the 2007 European Challenge Cup final defeat to Clermont Auvergne through injury. Despite being troubled by knee injuries for several seasons Fidler joined Cinderford before the start of the 2008/2009 campaign, joining former Kingsholm colleagues Pete Glanville, Andy Deacon and Mark Cornwell at Dockham Road. After a year at Cinderford he took up his first player coaching role with Old Patesians RFC before the start of the 2009/2010 season in National Three South West, replacing previous forwards coach and ex Worcester and Gloucester prop Chris Fortey. Rob Fidler showed promise as a talented forward from a young age, representing England Schools 18 Group, England Colts and England Under 21’s, often playing in the back-row during this early part of his rugby career. He was first selected to play for England A during the 1996/1997 season, a level he went on to play at on numerous occasions. Clive Woodward became England coach in 1997, which led to greater opportunities for Fidler on the international stage. He was selected to play for an England Rugby Partnership side against New Zealand at Ashton Gate in November 1997, which the Kiwis won with a narrow 18-11 victory. Fidler impressed and was selected to retain his place in the England A side against the same opposition at Welford Road, which the Kiwis won 30-19. He eventually made his debut for the senior England team on the 1998 tour of Australia, New Zealand and South Africa. His first full cap came in the 40-10 defeat to New Zealand at Eden Park in Auckland on 27/06/2008 and his second and final cap came on the same tour in the 18-0 defeat to South Africa at Newlands in Cape Town on 04/07/1998. While Fidler was never to play for the full England team again he was called up to the England squad by Clive Woodward for the tour of North America at the end of the 2000/2001 season after Ben Kay injured his knee in the test victory over Canada, going straight into the England A team that played USA A. He was also selected for the England A tour to Argentina at the end of 2001/2002 season after Gloucester team mate Ed Pearce was forced to pull out through injury.